The wines released this spring by Tinhorn Creek Vineyards all bear brilliant new labels. This seems to be the fourth redesign since the winery opened in 1995. The new labels are crisp and fresh. The winery’s name and the varietal stand out smartly on white textured paper. The bottles now look as sharp as Barack Obama in his pristinely white dress shirts. There is more going on here than a label overhaul. The wines themselves have benefitted from subtle but important style shifts as winemaker Sandra Oldfield has once again raised the bar. 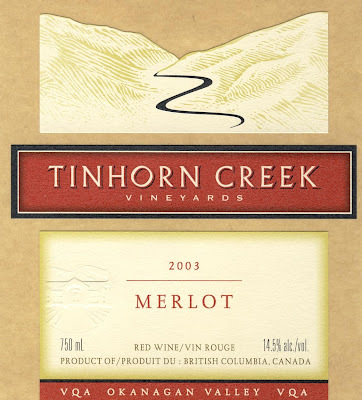 The new labels also speak to a growing sophistication of Tinhorn Creek’s consumers. Gone are the precious back labels in which each varietal was assigned a personality. You have to ask: What were they smoking? The new back label is just the facts: a few words on the winery’s history, a note on how the wine was made and what it tastes like; and useful food recommendations. Three whites from 2008 have just been released, while other releases are scheduled for summer and fall, depending on when Sandra concludes the wines are ready for release. One of the several changes is that Tinhorn Creek will let some of its wines mature longer in bottle before releasing them, starting with Pinot Noir. The 2008 Pinot Noir wine will be aged in barrel and bottles for three years (one year more than the current practice) before coming to market. A new premium Pinot Noir the Oldfield Series label will be held back four years. The point is to let the wines develop character and richness in the winery’s cellar, since most consumers drink wines almost as soon as they buy them, thus missing the quality improvements that happen with a little cellar aging. While it is not cheap for a winery to hold inventory back, Tinhorn Creek is not planning to raise its prices significantly, if at all. The Pinot Noir will remain under $20 and several of the Oldfield Series wines remain under $30. That makes them among the Okanagan’s most reasonably priced reserve wines. Note that the winery has tweaked the name of its premium tier to Oldfield Series from Oldfield’s Collection. This is in keeping with expanding this from the original two – Merlot and 2Bench White – to include as well Syrah, Pinot Noir and 2Bench Red. About 20 percent of the winery’s total production is being directed to the premium tier. 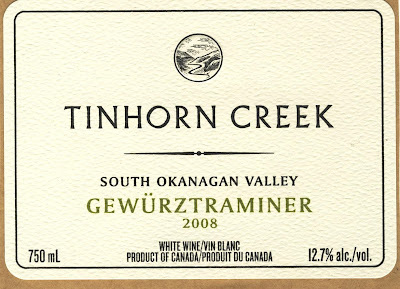 Tinhorn’s 2008 whites – like so many of the Okanagan whites from 2008 – reflect the fact that 2008 was a very good vintage for white wines. Vintners are still assessing the 2008 reds. Sandra reports that her reds, while soft in tannin, have good acidity, deep colour and lively flavours. The implication is that the 2008 reds will be earlier-drinking reds than the last few vintages. Gewürztraminer 2008 ($16.50). In the early 1990s Tinhorn Creek decided to include Gewürztraminer in its new plantings at Sandra’s suggestion, after she vetoed Pinot Blanc as too similar to Chardonnay. 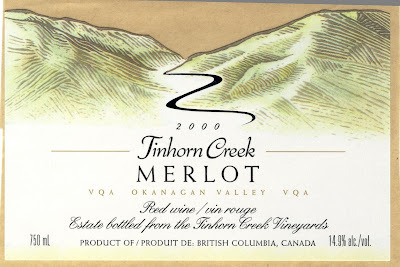 The variety has become one of Tinhorn Creek’s most popular wines. The 2008 is, arguably, the best one yet from the winery. It begins with lovely spicy aromas (the winery says they are reminded of the sagebrush growing all over the south Okanagan). The flavours present an array of tropical fruits, including lychee, peach and grapefruit. The wine has a dry and crisply refreshing finish. 90 points. Pinot Gris 2008 ($14.50). Sandra had never dealt with Pinot Gris before arriving from California in 1994 to make Tinhorn Creek’s wine. At the time, there were only a few other wineries here making it – and each winery had a wildly divergent style. She explored a variety of approaches, even aging half the blend in oak, before settling on Tinhorn Creek’s classic fruit-forward unoaked Pinot Gris. Oldfield Series 2Bench White 2008 ($23). This is Sandra’s aromatic blend. It is a complex dry white with spicy and floral aromas, with flavours of melon and citrus and with a crisp finish. The current blend is 33% Sémillon, 31% Chardonnay, 20% Sauvignon Blanc, 13% Viognier, 3% Muscat. Sotheby’s International Realty is one of the big names in the sale of luxury real estate around the world. Five years ago, Sotheby’s found the Okanagan and acquired listings for eye-popping Okanagan estates (one Kelowna mansion with 38 acres currently lists at $8.7 million). Now Sotheby’s has found wineries and vineyards. It has just announced an “exclusive” listing of the Holman Lang Vineyard Estates. Sotheby’s Vineyard Collection (http://www.vineyardcollection.ca/) also lists three properties now operated by Sonoran Estate Winery of Summerland. Over the past year, several British Columbia wineries have offered themselves for sale, generally without success because of the environment for finance. Three deals at least collapsed because the American lenders suddenly pulled out. Can Sotheby’s swim against that tide? Keith Holman, who runs Holman Lang with his wife, Lynn, believes that Sotheby’s has the international reach to attract well-heeled buyers. Once those people appreciate the Okanagan’s beauty, lifestyle and potential, they will want to buy a piece of this paradise. The Holmans are long-time orchardists in the Penticton area. Their first winery, Spiller Estate Winery (a fruit winery) was opened in 2003 on a strategically located Penticton property with a heritage house now operated as a bed and breakfast. Having caught the wine bug, they launched nearby Mistral Estate Winery in 2004. At the same time, they were able to buy the neighbouring Benchland winery (renamed Stonehill Estate Winery). The deal made sense because the two vineyards are next to each other. In 2005, the Holmans bought Lang Estate Vineyards. One of the original wineries on the Naramata Bench (today more than 20 wineries operate on the Bench), Lang, which opened in 1990, gave the Holmans access to established wine markets and to an experienced winemaker. Next, the Holmans bought a derelict view property on a Naramata Bench bluff overlooking Okanagan Lake and planted vines. This is now the location of their Soaring Eagle Winery, which opened in 2007, and their small Zero Balance winery, which opened in 2008. 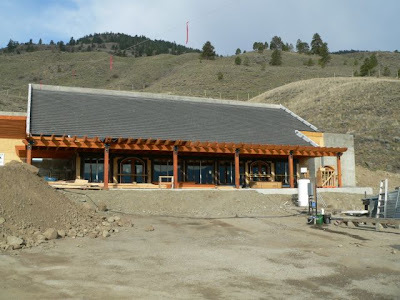 Last year, they also opened the K Mountain Winery in Keremeos, their first winery venture off the Naramata Bench. Mistral Estate Winery for $5,500,000. This winery occupies a 17-acre property. The upper seven acres is not in the Agricultural Land Reserve and thus is available for residential development. Houses here would have views not only of vineyards and orchards but also of the city of Penticton. Stonehill Estate Winery for $3,975,000. This winery occupies 9.6 acres. The vineyard grows, among other varieties, an Austrian red called Zweigelt. The predecessor winery, Benchland, was the first to offer this wine in British Columbia. Morgan for $2,400,000 (or $2,600,000 – there is a discrepancy in the listing materials). This is 12.8-acre property that is now a cherry orchard. Sotheby’s also is offering all three of the winery and vineyard properties associated with Sonoran Estate Winery at Summerland. Arjan Smits and his son, Adrian, have had these properties on the market for several years. Again, the objective is to sell perhaps one and put the cash into the rest of the business. Sonoran opened its first winery in 2004 north of Summerland, on a steep slope below Highway 97. The winery has now been relocated to a property on Gartrell Road, the street at the south edge of Summerland along with five wineries now are located. Both the Gartrell Road winery (with three acres of vines) and the original winery (which includes a huge nine-bedroom house and 4.5 acres of vines) are listed at $3,600,000 each. The three-acre vineyard next to original winery is listed for $3,000,000. Are all of these properties aggressively priced? Perhaps the Sotheby’s buyers can spot the potential of the Okanagan that will turn these into trophy buys. Japanese wine consumers famously confused the countries after the 1985 Austrian wine scandal and stopped buying both Australian and Austrian wines. I would be surprised if consumers in British Columbia are making that mistake, if only because there are not enough Austrian wines in the market to confuse anyone. The B.C. Liquor Distribution Branch currently has 11 Austrian wines compared with 495 from Australia. Everything Wine has 21 Austrian wines compared with 748 from Australia. Austrian wines have almost nothing in common with Australia. A more appropriate comparison might be New Zealand which, like Austria, is a relatively small producer of wines that are high in quality and often a bit pricy. The New Zealanders have penetrated the British Columbia market. Everything Wine lists 132 New Zealand products while the LDB has 90. There should be more Austrian wines here. In the United States, one of the hottest wines in recent years has been Grüner Veltliner, Austria’s flagship white variety. One would have expected that trend to have crossed the border by now. There has been a chicken and egg problem. Until recently, there was only one importer in Vancouver who represented a mere handful of Austrian wines (and that importer seems to have left the business). Other agents would not pick up Austrian wineries (even though several sought agents here) because they perceived that was little market for Austrian wine. Of course, there was not enough Austrian wine to build a presence in the market in the first place. After you, Alphonse! There is a breakthrough on the horizon. Austrian wineries have at last been taken on by major importers. Authentic Wines & Spirits represents Laurenz Five Fine Wine. Christopher Wines & Spirits has taken on Weingut Stift Göttweig and Weingut Stadt Krems. Delancey Direct has taken on Winzer Krems. Renaissance Wine Merchants represents Schloss Gobelsburg and Weingut Bründlmayer , one of the greatest wineries in Austria. Select Wine Merchants is representing Salomon Undhoff. Terrarosa Imports, which is associated with Marquis Wine Cellars, handles Weingut Loimer and Weinlaubenhof Kracher. At the recent Vancouver tasting, which was sponsored by the Austrian Wine Marketing Board, several Austrian wine brokers attended, looking to connect with yet more agents in British Columbia. For example, Michael Thurner, who used to run the Wine Marketing Board but now has his own company, was showing wines from such great producers as Weingut Jurtschitsch, Weingut Familie Markowitsch and Johanneshof Reinisch. I came away from the taste with notes on 52 wines, most of them white. None scored less than 85 and a remarkable number scored 90 or better. There were almost as many more to taste but time was up and the palate exhausted. Here are my 90 points or higher wines. Note some wines have vineyard names. Some of the top quality whites from the Wachau region may also be identified with the curious term, Smaragd. It is the name of a local lizard. Go figure – but it always signifies a quality wine. Tement Zeiregg Sauvignon Blanc 2007. Tement is a fairly new winery in southeastern Austria that is one of Michael Thurner’s clients. It offers an appealing range of wines, from entry level to this outstanding Sauvignon Blanc, a lush wine tasting of tropical fruit, enhanced by spicy oak notes. Austrian Sauvignon Blanc wines are every bit as complex and delicious as those from New Zealand. Jurtschitsch Riesling ‘Zöbinger Heiligenstein’ 2007. Another the Thurner’s wineries, Jurtschitsch is run by three brothers and their families and also offers everything from entry level to spectacular wine. This is an elegant Riesling, with flavours of lime and minerals and with a dry finish. Austrian Rieslings should not be confused with German Rieslings; the Austrian versions are more food friendly. Weingartnerei Aichinger Grüner Veltliner Alte Reben 2007. This winery is looking for an agent here. Keep your fingers crossed. This is a fantastic wine with concentrated flavours of cantaloupe, apricot and peach with a touch of white pepper and a full texture. White pepper is a common and appealing varietal mark of Grüner Veltliner. Weingut Stadt Krems Grüner Veltliner ‘Weinzierberg’ 2008 ($24). This is a lovely juicy wine, with flavours of pears and with a nice mineral note on the finish. Weingut Stadt Krems Riesling ‘Grillenparz’ 2007 Reserve ($33). This is a great Riesling, with complex flavours of orange rind and tangerine wrapped around a backbone of minerality. Fantastic quality from a city-owned winery! Krems is one of Austria’s most attractive wine cities. Weingut Stift Göttweig Grüner Veltliner ‘Göttweiger Berg’ 2008: Stift Göttweig is a beautiful Benedictine monastery founded in 1083 that has been making wine for 900 years. This wine has lovely ripe pear flavours with a touch of white pepper. Weingut Stift Göttweig Grüner Veltliner ‘Gottschelle’ 2007 ($33): Even more concentrated than the previous wine, this tastes of pears and peaches enhanced with minerality and white pepper. Weingut Stift Göttweig Riesling ‘Göttweiger Berg’ 2008 ($24). A fine dry Riesling, tasting of melons, citrus fruits, green pears. Weingut Brundlmayer Grüner Veltliner ‘Käferberg’ 2006 ($70). Yes, this is expensive but what a wine! Honeyed pear and melon, full-bodied, with a very long finish. Weingut Brundlmayer Riesling ‘Zöbinger Heiligenstein’ 2006 ($43). Mouthfilling flavours of citrus and peach, tasting remarkably fresh still at three years. 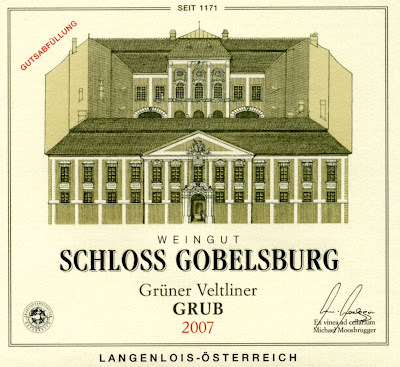 Schloss Gobelsburg Grüner Veltliner Reserve ‘Kammerner Grub’ 2007. ($50) Schloss Gobelsburg is a former monastery. In 1996, the monks leased the winery to Michael Moosburger and Willi Brundlmayer (and their wives). Michael has a Canadian connection – he once worked at the Banff Springs hotel. One of his closest Vancouver friends is chef Vikram Vij, in whose restaurant some of these wines are found. This particular wine is rich on the palate, with flavours of ripe pear, a spine of minerals, and a lingering finish with a hint of anise. Schloss Gobelsburg Riesling Reserve ‘Kammerner Gaisberg’ 2007. ($30) This is beautifully restrained, with citrus and mineral notes and a long finish. Weingut Rabl Riesling ‘Schenkenbichl’ 2007. Rabl has been in the British Columbia market and seems to be returning with a new agent. The wines are certainly fine, including this refreshing but ripe-flavoured Riesling, with tastes of citrus and honey. I did not get around to tasting the dessert wines but I know from previous experience there that Austria makes some of the world’s best sweet wines. The most renowned producer is Kracher, whose wines have long been available in the Marquis Wine Cellars store. These Austrian wines are all remarkable wines and should be more widely available. The irony is that I never even reached his table. There was just not enough time to taste thoroughly at each table. One cannot taste Naramata Bench wines like a butterfly because – to answer Rob’s question – the quality is high and getting better all the time. A case in point is Kettle Valley Winery. Kettle Valley’s wines have always been interesting but they have seldom shown as much finesse as they have in recent vintages. 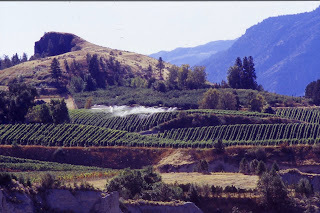 Kettle Valley came out of the blocks in 1992 with some of the biggest and most intense wines in the Okanagan. Owners Bob Ferguson and Tim Watts liked to leave their grapes hang for the extra bit of flavour and sugar. Then they made wine by leaving the fermenting juice in contact with the skins, making sure they extracted all the flavour their vineyard practises had captured. That even applied to Kettle Valley whites. This was the only winery that dared to ferment some of its Gewürztraminer in barrels. “We’ve backed off a little bit,” Tim told me. The change in style is most obvious with the white wines. These are now being released in the spring after vintage, for the most part, when they are full of fresh, exuberant fruit. The Kettle Valley reds are still bold and full-flavoured but also show a polished elegance. Here are some of my tasting notes on Kettle Valley's current releases. Kettle Valley 2008 Viognier ($24). This is a white where the flavours have a laser-like focus of citrus and mango with fresh acidity and a finish that never ends. 90 points. Kettle Valley 2008 Gewürztraminer ($18). This is a delicious wine, with flavours of pink grapefruit and lichee and an aroma of spices and rose petals. Tangy and refreshing. 90. Kettle Valley 2006 McGraw Estate Merlot ($35). Made with grapes from a low-cropped vineyard, this is a wonderful expression of Okanagan Merlot. The aromas include vanilla, coconut and spice and recall a Christmas cake. The wine is full-bodied and brooding, with layers of figs and other dark fruit. 90. Kettle Valley 2006 Rock Oven Red ($35). This is a blend of Cabernet Sauvignon and Syrah. The latter variety adds an interesting not of leather and earth to the red berry flavours. It also softens the tannins, adding to the satisfaction of this wine. Five years ago, 10 wineries came together to create the Naramata Bench Wineries Association. That has triggered an important trend. The association, with 16 member wineries today, has so effective at marketing the region that Naramata Bench is more powerful more on wine labels than VQA (although most of the wineries produce VQA wines). When sub-appellations begin being carved out of the Okanagan appellation, Naramata Bench will be the first. In the eyes of most consumers, Naramata Bench means good to outstanding wines from one of the most beautiful vineyard regions in the Okanagan. Many of the wines command a premium in the market. The Naramata wineries have just held their fifth highly successful annual Vancouver tasting. The success of Naramata (http://www.naramatabench.com/) has inspired wineries in several other regions to form similar groups. The South Okanagan Wineries Association was formed in 2007 to raise the visibility of the Oliver-Osoyoos producers with marketing strategies comparable to Naramata, including annual tastings in the Vancouver and Victoria markets. Currently, SOWA is trying to come up with a catchier name for its region. Information is on its blog, at http://oliverosoyooswineries.blogspot.com/. Their next Vancouver tasting is their second “kitchen party” on May 26 at the Pacific Institute of Culinary Arts. Last year, the 10 wineries around Summerland, along with a vinegar producer, formed the Bottleneck Drive Association. Bottleneck Drive is an apt description for the country roads around Summerland that lead to the wineries. So far, its marketing efforts are limited to attracting wine tourists to Summerland. The website is http://www.bottleneckdrive.com/. Late last year, eight of the 11 wineries in the Similkameen Valley formed the Similkameen Wineries Association (http://www.similkameenwine.com/). They have scheduled a tasting event at Cawston in the valley on May 9; and they have a coordinator, wine educator Rhys Pender, who recently developed a vineyard in the Similkameen. The reinvigorated Fraser Valley Wineries Association (http://www.fvwa.ca/) now has 12 member wineries. They did an industry tasting last year and have scheduled the next one for 2 pm June 27, once again at the Highpoint Equestrian Estate Community. On Vancouver Island, the Wine Islands Vintners Association (http://www.wineislands.ca/) is the association for about 33 wineries on the island and on the Gulf Islands. Their most recent event was an April 13 tasting in Victoria. The association maintains an excellent website that includes even a brochure to be downloaded. WIVA so far has limited its activities to Vancouver Island, perhaps because of the wineries on the islands are small enough that they sell most of what they produce on the islands. Going forward, I expect all of these associations to become more active in marketing their sub-regions of wine country. Today, many wineries compete for sales in a marketplace where the demand for British Columbia wine appears to be levelling off. The wines are better than ever but the competition is better than ever as well. The question is: where does this leave the British Columbia Wine Institute? Now that running the VQA program has been moved from BCWI to the British Columbia Wine Authority, the BCWI is meant to be focussed on government relations and on marketing. BCWI also governs access by wineries to the 20 VQA stores, a valuable sales channel. BCWI’s marketing efforts are supposed to encompass the entire industry. For example, BCWI organizes major Vancouver and Victoria tastings twice a year. The next one, Bloom, is late May at the new Vancouver convention centre. BCWI also organized the participation of 56 British Columbia wineries at the Vancouver Playhouse International Wine Festival in March. Most participating wineries thought the event was a roaring success for them. Because membership in the BCWI is voluntary, and not exactly cheap, a number of wineries have opted just for their own associations. A few years ago, almost all of the Vancouver Island wineries cancelled their BCWI memberships, partly because they believed the Okanagan-focussed BCWI was doing precious little for the island wineries. (Several later rejoined BCWI.) Currently, the largest winery in the Fraser Valley, Domaine de Chaberton, is not a BCWI member. Smaller wineries are more comfortable in their local organizations which are locally controlled. The perception is that BCWI is controlled by the large wineries – a contention that BCWI would challenge. The reality is that both the industry’s politics and now the increased competition are driving the formation of regional wine promotion groups. BCWI acting executive director Lisa Cameron says that the BCWI has no reservations about the development of these regional promotional groupings because consumer promotion is not BCWI primary focus. BCWI is more concerned with providing business resources to its members and with lobbying governments. It is more appropriate for the regional bodies to do consumer promotion. Still being discovered by wine tourists, Twisted Tree Vineyards and Winery is a gem at the eastern edge of Osoyoos that opened in 2006. The winery had something of a coming out at the recent Vancouver Playhouse International Wine Festival. Beata and Chris Tolley, the owners, have kept a low profile in their initial years but, with some interesting wine offerings and production approaching 3,500 cases, they are bidding for more notice. Taking part in the wine festival was part of that strategy. Twisted Tree is the first Okanagan winery to release a table wine made from Tempranillo, the variety that is one of the major reds in Spain. There is more novelty to come from Twisted Tree, including wine from the Corvina grape (the grape of Italy’s Valpolicella) and from Tannat (the big red of Uruguay). The winery’s delicious 2007 Viognier Roussanne blend, which was released last year, is sold out but might still be on some restaurant wine lists. As these offerings suggest, the Tolleys have brought some original thinking to the Okanagan wine scene. The Tolleys both had successful business careers in Calgary before switching to wine. Chris was a software engineer and Beata, who was born in Poland, is a chartered accountant. “We were looking for something more, something better, and we decided to do a winery and vineyard,” Chris says. After returning returning to Canada, the Tolleys had purchased an orchard that for years had sold its products through a fruit stand beside Highway 3, just on the eastern edge of Osoyoos. The venerable cherry trees on the property inspired the winery’s name. “Bent trees that had had so many prunings on them that they were looking haunted and twisted,” Chris recalls. Ironically, all the trees were removed so that vines could be planted efficiently. The Tolleys have six acres of vines on a west-facing slope overlooking Osoyoos and the lake. “We decided to plant varieties that we could not readily find in the valley,” Chris says. Thus, they planted Tempranillo, Tannat and Carmenère; the whites are Roussanne, Marsanne and Viognier. 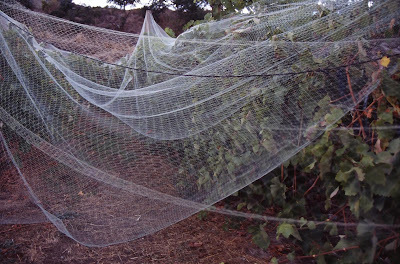 Corvina was planted later on another Osoyoos property that the Tolleys control. Meanwhile, they purchased grapes and launched with well-made wines - Their winery has been built where the fruit stand once stood. The elegant wine shop offers views over the vines and the lake. In spite of what Chris said in 2005, they clearly caught on quickly, debuting with excellent wines made from purchased grapes. Previous releases have included Riesling, Chardonnay, Syrah, Pinot Noir and Merlot. Their source of Riesling grapes is no longer available to them but the other varietals remain in the portfolio. Twisted Tree also has developed a subsidiary label called Second Crossing for value-priced wines (under $20) that sell through VQA stores and private wine stores. The Twisted Tree wines can be purchased directly through the winery’s website. Twisted Tree 2007 Tempranillo ($27.90). A wine with a jewelled ruby hue, this begins with aromas of red berries, mocha chocolate and minerals. On the palate, it has spicy flavours of cherries, currants, mocha and coffee. The firm texture suggests that the wine will develop even more complexity and richness with a year or two of cellaring. 88 points. Twisted Tree 2007 Pinot Noir ($24.90). I tasted this a few months ago, shortly after it was released, when the wine was still tight. But in retasting the opened bottle several times over a few days, I found that the fruit and the oak were coming into harmony and the wine opening up with attractive spicy raspberry notes; and the texture showed the classic fleshiness of the variety. 87. Second Crossing 2007 Pinot Gris Chardonnay ($15.90). This wine represents great value – fresh, uncomplicated, fruity, with flavours of pears, peaches and tangerine. 87. Second Crossing 2007 Merlot ($17.90). This is a big wine for the price, with bold oak supporting the spicy aromas of red currants and plums and with almost 15% alcohol. When the wine is decanted and allowed to breathe for a few hours, it reveals its rich ripeness. 87. At Hester Creek Estate Winery this spring, it is out with the old and in with the new. 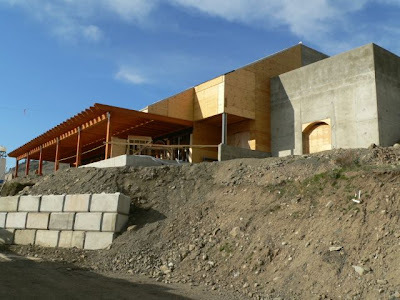 A $4 million 35,000-case winery, partially buried into the hillside above the winery’s south Okanagan vineyard, is nearing completion. The tasting room, with a spectacular view across the valley, is expected to be open by June. Meanwhile, the existing tasting room remains open. In 2010, it may be converted into a restaurant. The entire 23,000-square-foot winery, packed with modern winemaking equipment and tools, will be complete in time for the crush this fall. During the past week, demolition has begun on the former Hester Creek winery. Believed to have been erected in 1982, it was one of the oldest winery buildings in the Okanagan. It was built by Joe Busnardo, the colourful vintner who opened Divino Estate Winery here in 1983 to process the grapes from the vineyard that he had begun planting in 1968. Now about 75 acres in size, this was one of the earliest plantings of European grapes in the south Okanagan. Joe did grape trials with dozens of varieties, including a number from his native Italy. That is why the vineyard to this day has the Okanagan’s only Trebbiano vines, turned into a popular white by Hester Creek. Joe sold the winery in 1996 and moved Divino to the Cowichan Valley. The new owners renamed the Okanagan property Hester Creek, after the creek on the south side of the property. The creek, in turn, was named by Judge Haynes (first customs officer at Osoyoos) after his daughter. Today, the Hester Creek wine label has a stylized image of a female swimmer gyrating behind a fish. Legend has it that Hester Haynes liked to swim. The various owners of Hester Creek since 1996 made as many improvements in the old winery building as could be accommodated, including upgrading the dodgy electrical system. However, Curt Garland, the current owner, concluded the weary building was past its due date almost as soon as he took over the winery in 2004. Winemaker Robert Summers, a veteran Ontario winemaker who was recruited in mid-2006, began designing the new winery that fall. The winery is partially buried: 13,000 cubic meters of soil was removed, the winery was erected in this excavation and soil was returned to cover a portion of the roof. The object is to reduce the energy needed for heating or cooling the building. The exposed front of the building has a row of well-shaded windows that face east, looking across the Okanagan Valley. Behind the windows is the tasting room and wine shop. As well, there is a kitchen designed for cooking classes. These facilities complete the redevelopment of Hester Creek into a destination winery. Garland’s first step was the construction in 2007 of six Mediterranean-styled luxury guest villas. These are even higher up the hillside. Each one commands breathtaking views across the valley and its vineyards. It has been a long journey since Joe Busnardo first had his dream for this site. He was so far ahead of his time that in the 1970s he could not even get a satisfactory winery contract for his grapes. Surely, the potential of the site – one of the better vineyards in the south Okanagan – will be unlocked when Robert Summers gets to process well-grown grapes in a thoroughly modern winery this fall. There is not much point anymore in asking whether British Columbia wines can hold their own against wines from elsewhere in the world. Even so, a little reassurance is always nice. Jane Hatch, the sales director for Tantalus Vineyards, got that support in spades last week when she matched the winery’s newest releases against comparably-priced imports in a blind tasting for the British Columbia Wine Appreciation Society in Vancouver. The two Tantalus Rieslings were overwhelming favourites in the Riesling flight while the Pinot Noir was in the middle of the field in the Pinot Noir flight. The Tantalus Rieslings have been impressive since the first vintage in 2005, and not just because of the skills of Matt Holmes, the young Australian winemaker. This vineyard, on a hillside overlooking Kelowna, is one of the great Riesling sites in the Okanagan. An excellent clone of German Riesling was planted here in 1978 by Den Dulik, who then owned the property. In 1997, his daughter, Susan, opened a winery here called Pinot Reach. The Old Vines Riesling made here drew enthusiastic praise from many wine critics, notably Britain’s Jancis Robinson. In 2004 the Dulik family sold the vineyard and the winery to Eric Savics, a Vancouver investment dealer and wine lover. One of the first decisions by Eric was to replace some of the lesser varieties in the vineyard (such as Bacchus) and focus almost exclusively on Riesling and Pinot Noir. The 1978 Riesling vines were retained, of course, along with German clones of Pinot Noir, believed to have been planted in 1983. Building on that base, Tantalus then planted additional clones of both Riesling and Pinot Noir. Some of those new plantings are beginning to show up in the wines now and may explain why the 2008 Tantalus Riesling is so remarkably exuberant. With priority on replanting the vineyard, Matt had to make four vintages in the Pinot Reach winery, a cramped and not entirely adequate facility. However, there had been a tentative plan to replace the winery with a stunning showpiece designed by Bing Thom, a world-renowned Vancouver architect. Unhappily for collectors of architect eye candy, the global recession derailed this plan. Tantalus will build a new winery this summer – having already demolished the Pinot Reach building – but it will erect a more practical structure in keeping with the times. At the end of the day, it is the wine that matters. The wines, good from the beginning, are consistently getting better. The tasters at the BCWA event were swept away by the Tantalus Riesling 2008 ($23), of which 1,350 cases are being released. “The regular Riesling we produce is a crowd pleaser,” Jane acknowledged. Tasters are drawn in immediately by the fresh, zesty aroma of both flowers and citrus fruits. The aroma is powerful enough to fill the room. The palate tingles with tangy pink grapefruit flavours. The texture is enriched with a generous amount of residual sugar that is balanced with racy acidity so that the wine seems almost dry on the finish. This is a juicy wine that tastes like more. 91 points. Bold acidity has always marked the Tantalus Rieslings. “We don’t want to run away from the acidity but we have recognized we must refine it so it is less coarse,” Jane says. That is being achieved both in how the grapes are grown and how they are handled in the winery. The big brother is the Tantalus Old Vines Riesling 2007 ($30), of which only 260 cases are being released. This wine is aged in bottle an extra year before it is released because it needs that time for the acidity and the minerals to integrate. The wine is more complex than the regular Riesling and really should be aged another year or two before all of this complexity reveals itself. Dry on the finish, this is still a restrained wine with flavours of lime and lemon. The old vines bring finely concentrated minerals as well as fruit to the taste and texture. This is a connoisseur’s Riesling. I scored it 90 now but I can only see the score rising with bottle age. The other Rieslings in the flight included two fine Australian wines, St. Hallett Eden Valley 2008 and Bird in the Hand Clare Valley 2008. We also tasted a Riesling from Trimbach, a great Alsace producer, but the bottle seemed to be off. The tasters ranked the Tantalus Pinot Noir 2007 ($30) behind the Belle Glos Meiomi Pinot Noir 2006 from California and the Spy Valley Pinot Noir 2007 from New Zealand. However, Tantalus outscored two comparably priced wines from Australia and France. Being in the middle of the pack is just fine at this stage in development of a wine that is a work in progress. The 2007 vintage is richer and more vibrant than the winery’s 2006 because about 30% of the blend is from the new clones that were planted in 2005. As more of the new plantings come into play and as those vines mature, this Pinot Noir will get better and better. It is not bad now, when it comes to that. It begins with fragrant floral aromas; it has flavours of strawberry and it shows the silky texture, the beginnings of seductive fleshiness, that one expects in good Pinot Noir. The taste is pleasing even if the finish is a trifle short. 87. Overall, it was an impressive performance by the Tantalus wines, all of which are just being released. Naramata’s JoieFarm (the new name for Joie Wines and Farm Cooking School) has clearly raised the quality of its excellent wines to a higher level, judging from the four 2008 wines released this spring. The wines – three exuberant whites and an equally exuberant rosé – are downright delicious, very good with food and equally satisfying on their own. Ever since the winery’s first vintage in 2004, JoieFarm has produced appealing wines with personality. One comes to expect good wine from JoieFarm but when the wines are better than merely good, one looks for the explanation. There are at least three explanations. First, the vintage. Recently, I surveyed about 20 Okanagan winemakers to get their assessment of the 2008 vintage. Most said it was just an average year for most reds although a better than average year for Pinot Noir. All agreed that it was a terrific year for white wines which have emerged from a cool vintage with good fruit flavours and tangy acidity. In short, 2008 was a good year for the sort of wines that are made at JoieFarm. Secondly, JoieFarm is no longer borrowing space in other wineries. The 2008 wines were made in JoieFarm’s new winery. A modern building with good equipment, it is a short walk from where JoieFarm owners Michael Dinn and Heidi Noble live. The new wines can be monitored with obsessive care by Michael and Heidi, and by their assistant winemaker. 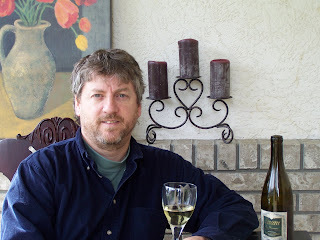 During the 2008 vintage, the assistant (for at least the second vintage in a row) was Vancouver wine writer Kenji Hodgson. Shortly, he will head to France for a year to polish his excellent native winemaking skills. Heidi and Michael, now producing close to 10,000 cases a year, have engaged a new assistant. Thirdly, the blend of the wines appears to have become much more complex and nuanced. For example: the winery’s 2004 rosé, which received good reviews, was made entirely with Pinot Noir. The 2008 rosé (which sells only for a $1 a bottle more) is a blend of Gamay, Pinot Noir, Pinot Meunier and Pinot Gris. The 2008 Unoaked Chardonnay is made with fruit from four vineyards in three different growing regions of the Okanagan. It is hard to say whether that is deliberate or just a function of the winery’s increased production. In 2005, when the winery made only 450 cases of unoaked Chardonnay, it needed to draw Chardonnay from just two sources (along with a dash of Pinot Blanc). In 2008, the winery made 1,254 cases of unoaked Chardonnay, a production that allowed it use more sources of Chardonnay but no Pinot Blanc. The flagship wine here, modelled on Alsace white blends, is JoieFarm 2008 A Noble Blend ($21.40). In the 2004 vintage, when 500 cases were made, the wine was a blend of three aromatic grapes – Gewürztraminer, Kerner and Muscat. The current release – 3,118 cases plus 360 magnums and 17 double magnums – blends six varieties. The wine is 36% Gewürztraminer (from three Naramata vineyards), 17% Kerner, 16% Pinot Blanc, 13% Auxerrois, 12% Pinot Gris and 6% Oraniensteiner. Significantly, JoieFarm is buying these grapes from long-established vineyards that a naturally low yielding. This wine begins with inviting aromas of spice and citrus that explodes from the glass. On the palate, there are flavours of lime, grapefruit, green apple and melon, with bracing but refreshing acidity that gives the wine a crisp finish. There actually is some residual sugar, which adds to the body of the wine, but the balance is so exquisite that the finish is dry. One more virtue: the alcohol is a moderate 12.5%. Rating: 92 points. 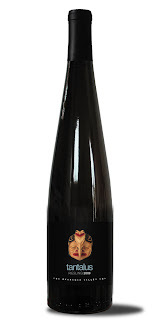 The JoieFarm 2008 Riesling ($20.40), of which 1,071 cases were made, has only 11% alcohol and enough residual sugar to qualify as a late harvest wine – except that the wine again is brilliantly balanced with racy acidity. The impression is of a wonderfully fruity wine, not a sweet one. It begins with inviting floral aromas. On the palate, it has flavours of pink grapefruit with a squeeze of lime. The acidity, the layers of fruit and the sugar combine to make this a juicy mouth-filling wine with great length, one of the top five B.C. Rieslings. 90 points. The JoieFarm 2008 Rosé ($18.90), of which 2,204 cases and 575 magnums were made, is a wine of considerable power and heft while still managing elegance. Once again, the aromas explode from the glass - spice, rose petals, strawberries. There is matching explosion of flavours: pink grapefruit, rhubarb and strawberry compote, sour cherries, apples, with a refreshing, tangy finish of great length. The vivacious, lively rosé delivers a remarkable array of delicious fruit to the table. 91 points. The bottom line: these wines offer excellent value for the price. It is worth making that point because, in a recent unguarded comment to a journalist, Heidi suggested that some British Columbia wines are not good value. She is absolutely right, even if she found herself issuing a statement later to put her comment in context. One has to say that her candour is as refreshing as these wines. Dave Kasper, a Langley businessman who owns Select Wine Journeys, is beginning his third season of leading uniquely personal wine tours to the Loire. His story should inspire any one wishing to change careers in order to follow a passion. A bilingual Montrealer with a degree in geography and sociology, Dave spent five years in the early 1980s playing major junior hockey in Quebec. He was drafted by the New Jersey Devils but only had what he calls “a cup of coffee” at the training camp. His brother, Steve, had a long NHL career as a player and a coach (mostly with the Boston Bruins). Dave went into business after college, as a sales representative for a major textile producer. In 1993, he was transferred to British Columbia. Seven years later, he set up his own firm, D. Kasper Agencies Inc., representing textile suppliers. Changes in world trade and the rise of China as a low cost manufacturer have pretty well wiped out the Canadian textile industry. While he still represents some specialty textile producers, he started in 2004 to look for fresh career opportunities. After a careful self-assessment, he settled on finding something connected with his passions – wine, history and communications. By coincidence, he and his wife, Margaret, had close friends in the Loire Valley of France – the representative of maker of wine label printing technology who, in 1995, moved into the house next door to the Kasper home in Langley. He was on a two-year assignment to introduce digital printing systems at Tapp Technologies, a Langley producer of wine labels. Dave’s neighbour spoke no English. The Kaspers, being able to speak French, became close with their neighbours before they went back to the Loire in 1997. In 2001, Dave and his family vacationed in the Loire for a month. Their friend arranged visits to a number of wineries. “I just fell in love with it,” Dave says of winery touring. When he started planning a career shift in 2004, he recognized that he could build his Loire contacts into a wine touring business. He rehearsed the idea with one tour in the fall of 2006. Since then, he has been scheduling eight week-long tours a year between April and October. There are, of course, many European wine tours organized by various travel agents, usually focussed on high profile regions like Burgundy, Bordeaux or Tuscany. By comparison, the historic Loire is a bit off the beaten path. Just a little more than an hour from Paris by rail, it is a region with medieval cities and centuries-old chateaux (one of which serves as the hotel for Dave’s tour groups). The wines stand apart from other French wines – tangy Chenin Blanc, Cabernet Franc notable for its vibrant fruit flavours and exceptional Vouvray sparkling wines. The producers that Dave favours are the artisans who personally take the time to show their interesting cellars, often caves deep into clay cliffs, and to host tastings. One tour last fall, for example, included a visit to the 12 kilometers of underground tunnels that serve as the cellar for Domaine de la Roche Fleurie in Chancay, owned by a young organic winegrower, Sebastien Brunet. The winemaker even allowed Dave’s guests to help pick grapes. “Each season we add a new winemaker or two to our visits,” Dave says. The 2009 tour offerings are displayed on Dave’s website, http://www.selectwinejourneys.com/. The tours are built around three choices of theme – cuisine and wine, history and wine, or walking and wine. The number of participants is capped at eight and the cost is between $2,800 and 3,000 a person (excluding air fare). The first tour (history and wine) is scheduled for the end of April and the last three tours run from mid-September through early October, right in the middle of vintage. “I’m particularly interested in Old World Wines,” says Dave, who has begun to research other European wine regions that are also off the beaten path.